Apple announced on Thursday that a new feature called "Up Next" has been added to Apple Music, a new video documentary series that promises to feature a new artist every month. 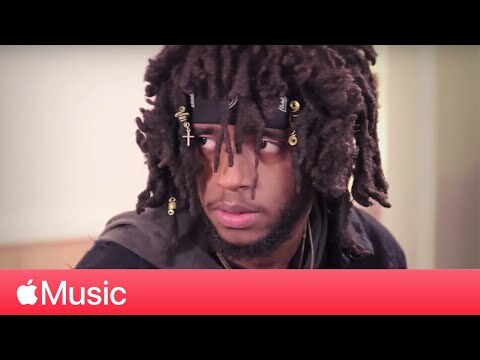 The addition was heralded by the Apple Music Twitter account, which revealed 6LACK to be Up Next's first featured artist. A new artist every month. Up Next's first offering includes a documentary that discusses 6LACK's career, an interview with Beats 1 DJ Zane Lowe, a video of a live performance, and a free album. Lowe and 6LACK will appear on The Late Late Show with James Corden on Thursday night to promote the launch. "I kinda feel like battle rap gave me all the tools I needed to write songs today," 6LACK told Lowe. "Battle rap is about how much you can say and putting so many different words and expressions together to get your point across and songwriting is like how can i get that same point across but by saying less." I feel like taking XLax looking at 6LACK. If they're gonna do this they need to showcase guys better than this dude. His music is less than mediocre and he looks like he's about to sadly fall asleep at any moment. Showcase Duckwrth if you wanna quality up and coming hip hop artist. Or the band RDGLDGRN who worked with Dave Grohl and Pharrell to help make their first album. All Apple Music is these days is a crappy extension of popular radio when it comes to new music promotion. Sad to think I had such hope for the service back in its infancy. Of course, such is to be expected with a guy like Iovine in charge. Rap and hip-hop only occasionally speak to me (I like soul/R&B singing more than spoken-word generally, across all genres of music). The sample track played during the promo wasn't bad, though, IMO (haven't listened to the full interview yet. Hopefully Apple/Zane/Beats1 will use this opportunity to cover a bunch of *very different* artists, unsigned indies, and so on. I think it's great that B1 tries to shine a light on up-and-coming, I just hope it's not just "we think these guys will eventually show up in the Top 40"; most of my favourite artists have never charted that high (like, say Bowie, or the Decemberists), but are legends now nonetheless. If I had any advice to give Mr. Lowe, I'd say that's what you're looking for: find and talk to the next James Brown, the next Elton John, the next Robert Fripp, the next Rodelius. Zane has an amicable yet interesting interview style. He's always been this way. He suits Apple Music and Apple, very much. If they're gonna do this they need to showcase guys better than this dude. Hopefully 'The Old Grey Whistle Test' for a new generation. Impressed with the strategy and potential for Apple Music.